Cruising is, inherently, a very healthy lifestyle. Without a car we are forced to walk everywhere which provides lots of good exercise. Contrary to what most people think, passages do not provide much of a work out, unless, of course, there is bad weather. Although the motion at sea provides good isometric exercise. The following are some of the things we do to insure good health while at sea and in remote places. Good hygiene is the first line of defense in staying well. Here are some of the things we do. Wash Hands - The primary thing that we do to insure good health is very simple and easy to do. We always wash our hands with soap before eating and, of course, after using the toilet. As cook, Judi always thoroughly washes her hands before any food preparation. If we are traveling or eating out and there is no water easily available, such as on a plane, we use the waterless hand cleaners. We seldom get colds, flu, diarrhea or other illness following this practice. 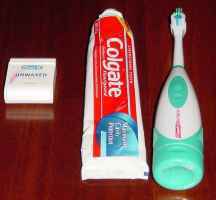 Dental hygiene - Good dental care is very important in order to avoid dental problems at sea or in remote locations. We both use battery-powered toothbrushes and find that our dental problems have been significantly reduced. We also try to make frequent use of dental floss to insure healthy gums. We strive to get our teeth cleaned every 6 months, if possible, but at the very least once a year. There is good dental care in most places we have stayed for a significant length of time. See List below under Medical Care in Foreign Ports. If you are a Diver and need a new filling or to have one replaced, please tell the dentist that you are diver and that it must be secure with no air gaps between filling and tooth or gum. Else when you do dive, the pressure difference may dislodge the filling. Nutrition - Good nutrition can be a problem, especially on long passages, due to the lack of fresh fruits and vegetables. Here is what we do. 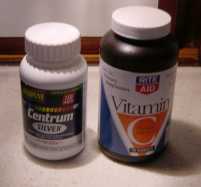 Chewable Vitamin C tablets (1000 mg) which we take if we feel a cold or sore throat coming on. Fresh local fruits and vegetables from local markets such as mango, papaya and in S.E. Asia, fabulous rambutans and mangosteens. Salads - now that we are in the Mediterranean there are lots of fresh ingredients available to make a wonderful salad with feta cheese, olives, tomatoes. Especially good when the temps are 95+ and you really don't want to cook. *Note: It is important to take a multivitamin with minerals, especially if you are relying on water supplied with a watermaker as this water contains no minerals. Potable Water - We usually add bleach to the water when filling our water tanks. 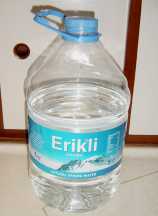 'Suspect' or bad tasting Water - In many cases (Turkey) the water is potable, but does not taste especially good, so we drink bottled water and use the water for cooking and coffee only. Non potable water - we do not fill our water tanks with non potable water. In Thailand, we could get 20 liter containers of water for about 20 baht which we used to fill our tanks. A real nuisance, but the water was good and inexpensive. Watermaker water - If we are in a clean anchorage, we "top up" our water tanks using our watermaker. But, since ours is a low output watermaker, we don't do this all the time. Rainwater - Our sun awning can be used to catch rainwater and we have often filled our tanks this way. If it hasn't rained for awhile, let the rainwater wash off the awning or decks before diverting it into your tanks. Bananas - if you buy a 'hand' of bananas or even a small bunch, it is good idea to dunk them in seawater on the way back to the boat to get rid all of the 'critters' that may be hidden in them before they get onboard your boat. Lettuce/Cabbage- Judi always peels off whatever is required and lets it soak for about 5-10 minutes in a mixture or water and bleach (approx. 1/2 tsp. bleach to 4 cups of water) before using. Rinse in potable water and towel dry with paper or cloth towels. Apples, Tomatoes, etc. - Wash thoroughly with a little soap and water. Carrots, cucumbers, green peppers, etc. - Rinse well and then peel before eating unless they are to be cooked and you like the skin (we don't). Broccoli, Cauliflower, - same as for lettuce, if to be eaten raw, otherwise just rinse and cook. Eating out in foreign ports - We are always keen to try the local cuisines and look forward to eating out. If confident that the food and water is good, then plunge in and enjoy. Eat hot, freshly prepared foods only. When we were traveling through China, we often could not communicate well, so we ate, rice, tomato and egg, stir-fried together in a wok. We were able to point to the ingredients and use sign language to make ourselves understood. Avoid stews and buffet meals that have been sitting around for a while. This is often the case when traveling by bus when the bus stops for lunch or dinner. In that case, try to carry some snack foods, or buy some fruit that can be peeled to eat. Drink cold drinks without ice or better yet, have them open the can or bottle in front of you. Avoid undercooked eggs - If you order fried, soft-boiled or scrambled eggs or omelets, be sure that they are well cooked, as they are prime carriers of salmonella bacteria. We NEVER eat out the night before a long passage, in order to preclude a bout of food poisoning, or food allergy problems at sea. I cannot stress enough how important it is to stay hydrated in the tropics. We carry a bottle of water with us at all times. Drink at least 1 quart (liter) of water (other fluids do not count) per day. For a long time, both of us complained of low back pain which we found was caused by lack of water. The pain was a result of acid buildup in our kidneys. Once we started drinking lots of water, we had no more pain. So before you think you have back problems, start drinking water. In malaria infested areas, we took the following precautions. In the tropics these wounds are very difficult to heal and can become easily infected. Wash well with clean water to remove any sand and coral, swab with betadine or other antiseptic and lightly cover with bandage and keep dry. If wound starts to 'weep' then remove bandage and expose to air. You should dress the wound daily with antiseptic. I also used a product that I found in Australia called MediHoneyTM, which is an antibacterial honey. If it does not show signs of healing after about 5 days, then seek medical attention. Sandfly (no, nos) bites - Calamine lotion provides some relief for the itching. Jelly fish stings - Vinegar lessens the pain. The damage done to your health by the sun cannot be overstated. This is what we do to try to avoid problems. Hat with flap that covers neck and ears. Bob has very light complexion and is especially susceptible to the sun. He has had pieces of himself removed in almost every major port we have been as a result of sun damage done when he was a child. Lately the pieces removed have been basel-cell skin cancers, which, although very slow growing, are worrisome nonetheless. In Singapore, he had to have costly plastic surgery performed on his ear, due to a large area that had to be removed. Doctors & Dermatologists We have had mostly good care by doctors in all places we have been, especially New Zealand, Australia, Singapore and Thailand. All doctors spoke English. Even in the remote Marquesas, we were given medicine for Elephantitis (which is a problem there) free of charge at the clinic on Nuka Hiva. To see specifics, see Medical heading under appropriate Destination page. Here is a list of some good hospitals and clinics that we have used in our travels. I stress that this is just a list of places we have personally used and gotten good care. Bangkok Phuket Hospital, Phuket, Thailand - For about $100 US, you can get a complete physical, including dental x-rays and exam, heart stress test, bone density test and chest x-ray. The hospital is very modern and the doctors and staff all speak English. Singapore - see Medical under Singapore City Destination page. Burn kit Contains several different sizes of 2nd SkinTM moist burn pads, thick gauze bandage rolls and adhesive tape. 2nd SkinTM is a product that looks like a soft pliable plastic patch. It is impregnated with sterile fluids and keeps the burn moist and also allows air to get to the burn for healing. When crossing the Pacific, Judi received a 2nd degree burn after being splashed on the stomach with boiling water. After cleansing with cool water and Betadine, she placed a 2nd skin patch over the burn and left it on for about 1 week. When the patch was removed, the burn was nearly healed with new skin growth over the burn. 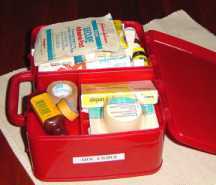 First Aid Kit Kept in small, easily grabbed plastic (lunchbox-type) container. Contains band-aids, antiseptic, antibiotic cream, adhesive tape, gauze pads. sting-aid pads for bee stings and mosquito bites. MedihoneyTM - Antibacterial Honey manufactured in Australia. This is one of the best topical treatment products we have ever come across for minor cuts, wounds, abrasions and insect bites. This stuff is terrific and unrivaled in healing difficult wounds. Cold Medicines and pain relievers Kept in small plastic (lunchbox-type) container. We always carry antihistamines for allergies and bee stings. Prescription Medicines I refrigerate these items in the tropics. We do not carry injectable drugs or needles.